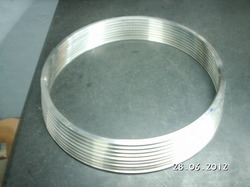 Manufacturer & Exporter of Retainer Ring. Our product range also comprises of Valve Trims, Valve Disc and Stellited Components. We are one of the leading manufacturers and suppliers of Retainer Ring. The offered retainer ring is specially designed for ball valves. 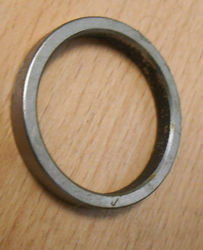 Our supplied retainer ring is made from superior grade raw materials such as stainless steel and monel. The offered retainer ring is highly acclaimed and liked by the industrial and domestic clients. We are offering a wide range of superbly designed Retainer ring Valves Components. For manufacturing them,high quality materials that are raised from trusted vendors are used. We keep on bringing forth most innovative and useful products for customers therefore they prefer to deal with us. The retainer rings are of Ball Valve retainer rings that are used for Petroleum Valve. Embarking on our strong domain expertise, wide range of Threaded Retaining Ring that are strong in nature and are performance based. Excellent strength, durability and wide application are the key driving features of the entire product line. They can be easily installed in the required area and are valued for wide industrial applications. Seat Retainer Ring/Retainer Ring and other types of Metal Rings are manufactured in various materials Alloy Steel, Carbon Steel & Stainless Steel, Inconel, Monel, Nickel, Hastelloy and other exotic alloys to fulfill the requirements of Valve industry. Looking for Retainer Ring ?